Helen's Book Blog: I completed the AVON 39: Walk to End Breast Cancer! 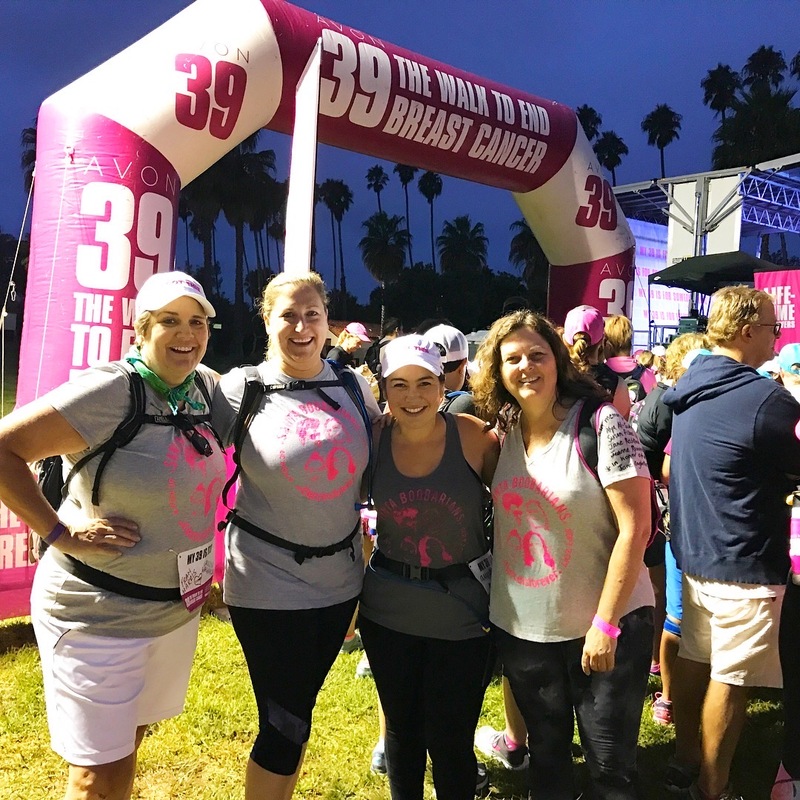 I completed the AVON 39: Walk to End Breast Cancer! 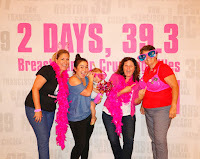 I've always wanted to do the AVON walk, but 3 days seemed too intimidating. Then in May a colleague asked me to join her team to do the AVON walk this September. It's now a 2-day walk so in a moment of optimism, I said yes. I have far too many women in my life who have been diagnosed with breast cancer. Some survived, but others did not. It really helped to walk for those women. Little did I know what I was getting myself into! 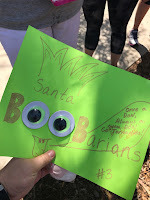 The Santa Boobarians! 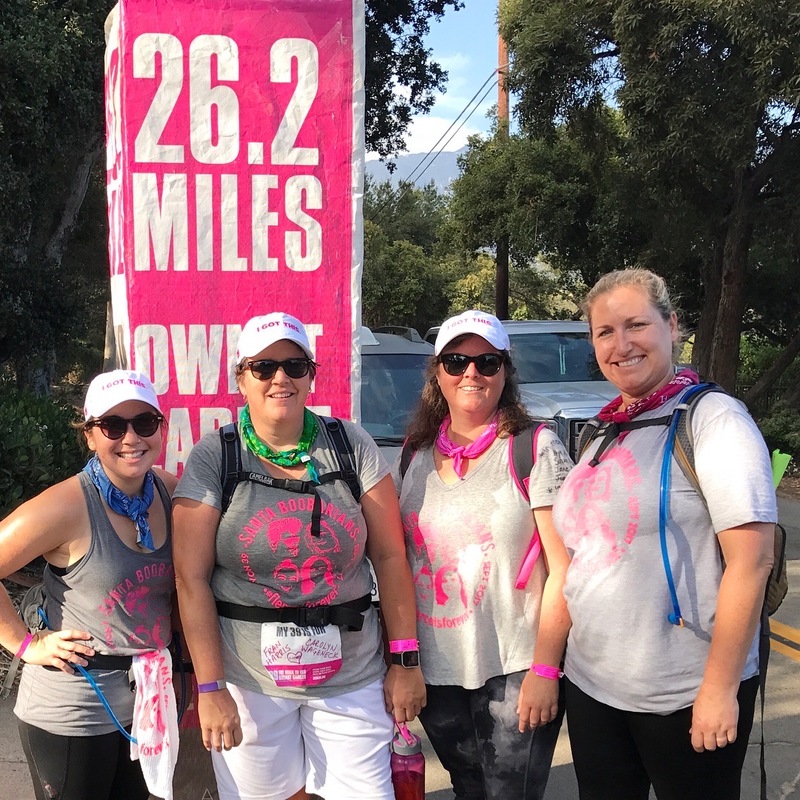 We are four women who all work for the Santa Barbara Unified School District. We range in age from 33 to 52 (that's me) and are all at the same level of fitness (not-so-fit is a good description). This group of women is what got me through the past few months; they are fun, funny, smart, interesting, and kept me motivated. We trained for July and August, following Avon's suggested milage. If you ever do a walk like this follow the training suggestion; we were really prepared by their increase of 2 miles each Saturday and one mile each Sunday, building up to walking 85% of the walk's distance. We met at the park on the beach at 6:00am Saturday along with the other 1500 walkers. It was dark, but the mood was festive with pink everywhere. It was an emotional start with brief speeches by survivors and women currently fighting the disease. There was even a woman in the crowd whose cat had died of breast cancer! The clincher was the Youth Crew, dressed in minion yellow t-shirts and blue tutus, who are all children with mothers that had/have breast cancer. 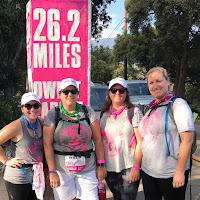 Day one is 26.2 miles. That's a marathon, people! Luckily it was foggy in the morning, but the afternoon was pretty warm. The most amazing part was the inspiration of the other walkers: men and women; young and old; healthy and not. Most wearing pink, some in costumes, and all with signs saying for whom they were walking. One man walked wearing his Chicago fire fighter outfit, pushing his mom in a wheelchair. This is the worst parade ever. Where are the floats? Wouldn't this be easier in a car? At mile 14 I broke off from my team to walk faster (yes, I have guilt about this), but a colleague from one of our high schools walked with me for 6 miles. As she stopped walking, my dad took over and walked 3 miles with me. I did the last 3 "alone." I walked the first half in 5 hours and the second in 4. Base camp was cool with pink tents, medics, foot massages, real food, a cool shower, and music. I am not a good camper, but it was fun to be part of the experience. I had no blisters and was tired, but feeling good. Day 2 is 13.1 miles. Yes, a half marathon. I awoke to small blisters on the balls of my feet, but I didn't have time to get to the medics before the walk started and they didn't seem to be too bad. What I didn't realize is that my feet were wet when I put on my shoes. Bad move. Blister pain is no joke. By mile 36 I made a stop at the medics and had them patch up my blisters, which made the last 3 miles bearable. I again broke from my team; it was so hot and my feet hurt so badly, I just wanted it to be done. I figured that walking faster meant less time on my feet. Arriving at the finish line was quite emotional and inspiring! So, I have a medal, incredible memories, and a real sense of accomplishment. Will I do it again? Probably not. Will I be a loud obnoxious cheerleader who travels the route to encourage others? Absolutely! 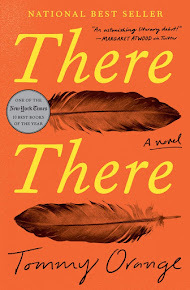 Now maybe I can get back into reading; it's been a month since I've read anything.